This chapter lists some frequently asked questions. Several Howtos explain how to manage some common tasks. My VM starts fine but seems to have lost the data of the last 6 months ... help !!! Power down the VM - if that is not possible or takes a long time - kill the VM. For reasons that do not matter right now the VM was started with a misconfigured snapshot-chain. If you continue to use it like this chances to recover the normal state of the VM will go down south. Do NOT allow any filesystem checks to continue - abort any chkdsk or fschk operations. Do NOT run any defragmentation tools. and all small text-size vmdk-files. Now don't act in haste. Go away from that VM and do not touch it the next hour ... drink a coffee ... relax. Once the danger to do anything very stupid is gone go back to the VM. If mission critical data is missing make a full backup of the complete VM as it is now. 9. - now you should know WHY something went wrong - does it make sense ? - if not go back to 1. 11. - does one edit of the vmx plus one edit of the CID-values per vmdk fix it ? - if NO ... are you sure ? 12. - are you sure ? It is expected behaviour that on first start the original Operating system complains and wants to check the disks. VMware tells me I am running low on disk-space ... help !!! This often happens during Snapshot-manager operations or with normal VMs that use any type of growing virtual disks. The VMware GUI then pops up a message and tells you to free up some space , continue or abort the operation. Do not answer this popup. Very likely both options will fail so the only possible way is to fix the problem at the root. or move some other data to a portable USB-disk on hosted platforms. When done - answer the popup. What is the most portable vmdk-format ? This will not work with images of single partitions. we need a vmdk description for a full dd disk-image named image.dd which size is 8589934592 bytes. As our dd-image is a uncompressed full disk image we can use the vmdk-type "monolithicFlat" or "vmfs"
For use with ESX we need the createtype vmfs so this time the result looks like. In case you want to edit this embedded description do NOT use hex-editors. This files can be very large so it may take a long time to load them into a hexeditor. Also you have to be very careful not to change the size of the file while editing. The much safer and easier ways is to extract the embedded description first. You must edit test.vmdk which is a monolithicSparse snapshot. Current size is 50 Gb. Opening this file with a hexteditor is unwise. Now you can edit the description with a texteditor like Scite, Notepad Plus or Wordpad. In the monolithic sparse formats the embedded description must fit in the second and third sector of the file. So when extracting or injecting it make sure you never change anything outside this range. If you accidentaly change the first byte of the fourth sector the vmdk is kaputt ! When working with the dsfo.exe and dsfi.exe always use the same range. 512 1024 is a safe range. Do NOT use a larger range - this will corrupt the vmdk ! If you use a Linux system you can use dd for the same purpose. Thanks to Robert from Vienna for the Linux dd-command and to Brian Lagoni for fixing it. The monolithicFlat and the vmfs are very similar. They both use a *-flat.vmdk data chunk. in the description is suffiecient. Let's have a look at a broken snapshot-chain. Tthe example you will see next is taken from some case I had in the german-forum recently. can't open snapshots because basedisk has been changed! parentFileNameHint = "path_to_parent" - this is used to find the parent-disk when VMware launches a vmx-file that has a snapshot as disk-reference. This paths must point from child - child - .... - child - parent. Check if this correct in this case: yes - no problem. Now every disk-description also uses two lines with CID-notes. The CID is a random value that gets autocreated by VMware. To check if any changes have been made to a parent - a child always notes the CID value of its parent. If this is still the same next start everything is fine - if not all alarmbells ring. the second child expects this value parentCID=06ebe4dc on his parent. Yes - the CID of the parent-disk is not the one that was expected by the child. So this snapshot chain is broken - you can not use it in a VM any longer. That depends - if you have done no changes to the basedisk you may be lucky and come out with a disk that is clean and readable. If you have done something like a defrag in the basedisk while you used it on its own the result can force a checkdisk at startup and can end with a complete data loss. So whenever you do something like this don't panic - think twice before you do anything at all. First understand what has gone wrong! This is the repaired version of descriptor-files that I send back to the poster. Looks almost identical - but I'm sure you will find what I have edited. all data to restore a lost descriptor for a vmdk from scratch. This also applies to embedded descriptors! - 3a. doublecheck the parameter adapterType against the vmx-file. version - set this to "1"
Extent description - this may be more than just one line ! better create them from scratch using the GUI. ... vmx| DISKLIB-LINK : Opened 'E:\bsd2\obsd.vmdk' (0xa): twoGbMaxExtentSparse, 4194304 sectors / 2048 Mb. ... vmx| DISKLIB-LIB : Opened "E:\bsd2\obsd.vmdk" (flags 0xa). by a VM that had no vmware-tools installed when it was last used. If the vmdk uses several data chunks you must calculate or better guess the size of each chunk. The type twoGbMaxExtentSparse usally has 4192256 sectors large chunks. The type twoGbMaxExtentFlat usally has 4193792 sectors large chunks. In both types the last chunk varies in size to fit to the overall capacity. Warning: if a vmdks was created with custom size chunks or was expanded earlier you can NOT follow this rule-of-thumb for calculating the size of the several extent description lines ! A *.vmss file = Virtual machine snapshot is a binary file with metadata for the snapshot. It has a copy of the vmx-file at a fixed location and so we use dsfo.exe again - or dd on Linux. A vmss-file = Virtual machine suspended state also has a copy of the vmx file that was used. The location inside the binary file varies so no extraction command can be given. and then it prints the vmx-parameters that were used . The relevant section starts at keyword: CONFIGURATION - next section is USER DEFAULTS. 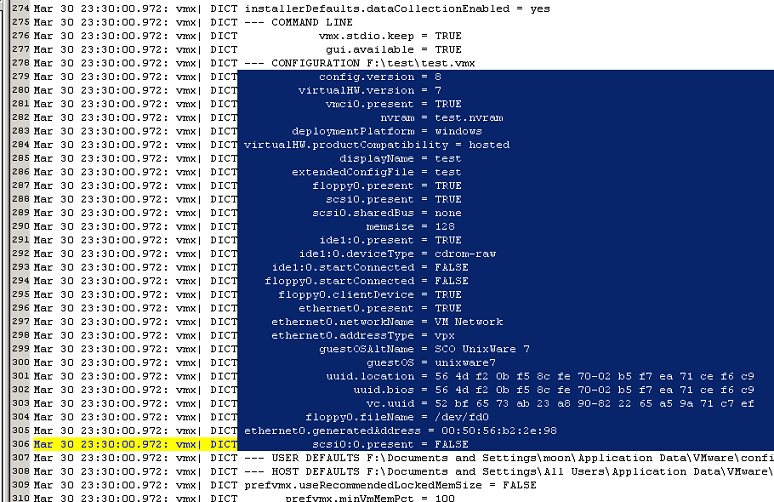 The example shows a vmware.log - the embedded vmx-file is shown in blue. Procedure works on all platforms. If you use a good text-editor like Ultraedit you can hilight the blue section and copy and paste it into a new file. you need to wrap the arguments in quotes - compare the black embedded text with the out-put vmx listed below. After extraction and final polishing the file should look like this. Note that "FALSE" is the same as "false", "TRUE" is the same as "true". The sequence of lines does not matter. You can sort the lines alaphabetically if you like. Undefined parameters with = "" can be skipped. uuid.location = "56 4d 14 e1 14 6c 51 a3-9d 82 14 8d ed d6 ba a1"
uuid.bios = "56 4d 14 e1 14 6c 51 a3-9d 82 14 8d ed d6 ba a1"
How to create a vmdk that can be stored on a set of CDs ? Workstation can create vmdks split in 2Gb slices. This slices do not fit on a CD so you may create a vmdk with custom size with vmware-vdiskmanager. This creates a vmdk named cd-slices-disk.vmdk of the nominal size 4690 Mb with each single chunk exactly 670 Mb. This should fit on a set of CDs easily. The first line creates the first chunk. The other lines simply expand the first chunk multiple times. Whats better - one-piece vmdks or split vmdks ? one disk = one file what the hell are all these files good for ? VMware Workstation uses the monolithic-disk type as a default. This is not very userfriendly - especially for beginners. How do I check if a snapshot is an orphan ? Orphaned snapshots are snapshots that are not part of an existing snapshot-chain. by any of the other vmdk-descriptions found in the same directory. In case any other vmdk references the snapshot it may be part of one branch of the tree. In case the snapshot is a direct child of the basedisk it may be a valid separate branch all by itself. In case the CID or parentCID of the snapshot are referenced by any other vmdk it may be a required snapshot even if the parentfile name hints don't match. What is the size of the snapshot file ? The larger it is the longer it has been in use - the more valuable data may be stored in it. Even If it is very small it may have never been used but it also may contain a single file - maybe just THE important one. Long story short: you have to make an educated guess after analysing the other vmdks in the same directory. Automated scripts that check for orphaned snapshots are only trustworthy if you can rule out user-mistakes. Should I defragment inside my guests ? If the VM uses monolithicFlat , twoGbMaxExtentFlat or vmfs (thick provisioned) then it behaves almost like a regular physical disk and the general advice to defragment regularly can be followed. If the VM uses any of the other sparse types , or uses a snapshot or vmfs (thin provisioned) then the result of a defragmentation inside the guest will be a enlarged vmdk with dubious performance gain - if any. So in effect the whole action is contra-productive. Defragmenation inside a guest that uses any type of sparse disk is only useful if the resulting larger vmdk is shrinked after doing the defragmentation inside the guest. On Workstation this can be done with the vmware-tools shrink option or with vmware-vdiskmanager. Similar on ESX the disk has to be wiped first - either using the vmware-tools or sdelete or dd. After that it can be copied into a new thin provisioned vmdk with vmkfstools for example.